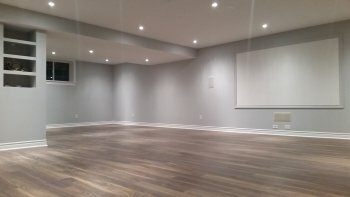 You can turn your basement into the ultimate entertainment center with	the help of OttawaFinishedBasements.com! With our expert renovation process,	the home theatre you want can be yours in no time. When you hire us, we	will draw on our teams’ more than 10 years of experience of design	and build projects to provide you with a home entertainment area that	you will absolutely love! You can have a customized home theatre space that is a perfect fit for	your specific visual and audio needs. However you are planning to set	up this theatre room, we can provide you with just the right design and	setup! We serve clients throughout the Ottawa area. To learn about our free design consultations, call us today at (613) 627-3410.